With the new Officer Pro series comes the all new Officer Pro Chronograph series. 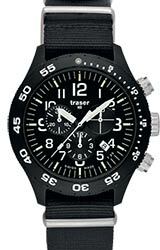 Following in the same style, this chronograph model has a no nonsense field watch look but with added functionality of a stop watch and rotating bezel. The Officers Pro Chronograph features a solid stainless steel case and sapphire crystal making this series even more durable than the original. 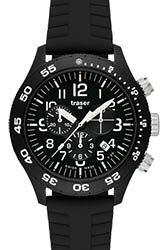 And with Traser's Trigilight illumination you'll be able to see the watch day or night, in any condition. The high contrast dial make it easy to read at a glance and full tritium illumination make sure you can read the time in any condition. Swiss Made fine jeweled quartz movement keeps perfect time and is tough, rugged and dependable.